In the end there’s just a song comes crying like the wind. A Red-shoulder Hawk flying above. I finished these two birds this evening while enjoying some music. The flying raptors have been a very rewarding challenge. It has helped me be more observant and disciplined. 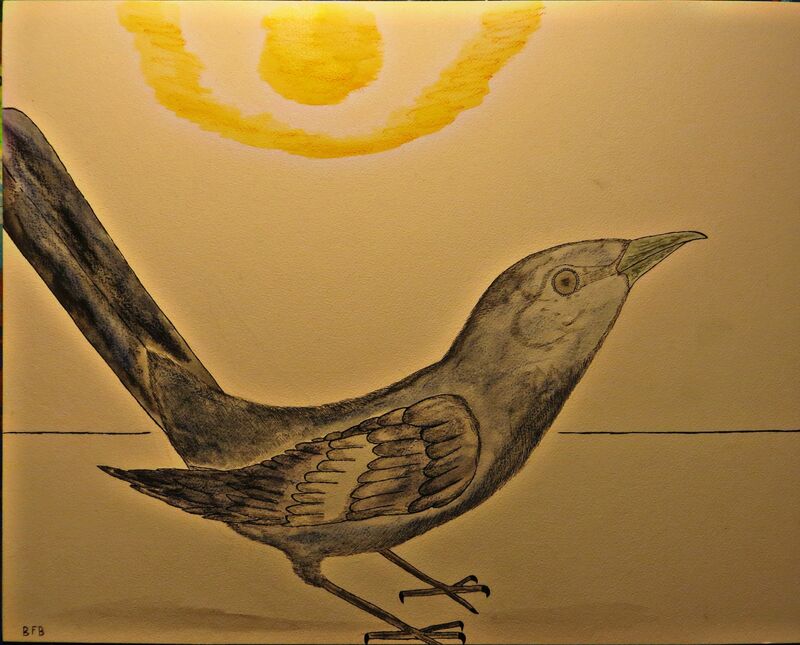 The Mocking Bird has been a long time favorite bird of mine from when I first moved to California. There was one always parked in the bushes outside my window and would go off in song at any hour. I can see why that would drive a lot of people nuts, but I was so amused by his ability to sing for 5 minutes and never repeat himself. I’ve been sketching them for a few years and finally got one down on cold-press board that I feel is up to the task. The Warbler factory is rolling along. 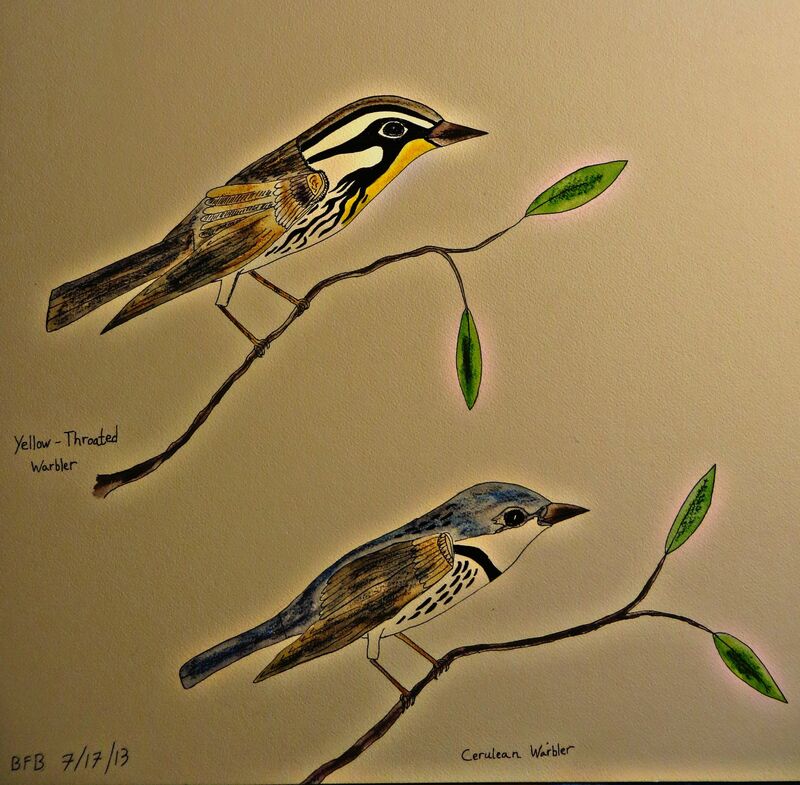 I started another two plates of warblers like these ones. 12 more total. When I’m finished with these next warbler collections I will have 30 warbler species total. I chose at random, but also looking for themes, one group of six I chose were: Nashville, Grace’s, Tennessee, Kentucky, Mourning, and Golden Cheek. I spend a few weeks on each plate looking to get the shapes and lines right. 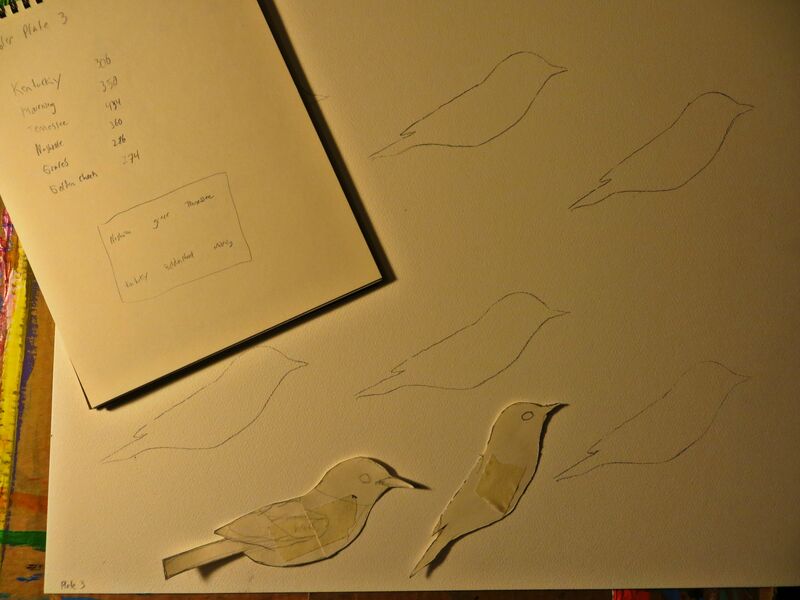 I made a paper bird that I cut out from a drawing I made of a basic warbler shape. It helps give me a base point of planning for the pages. 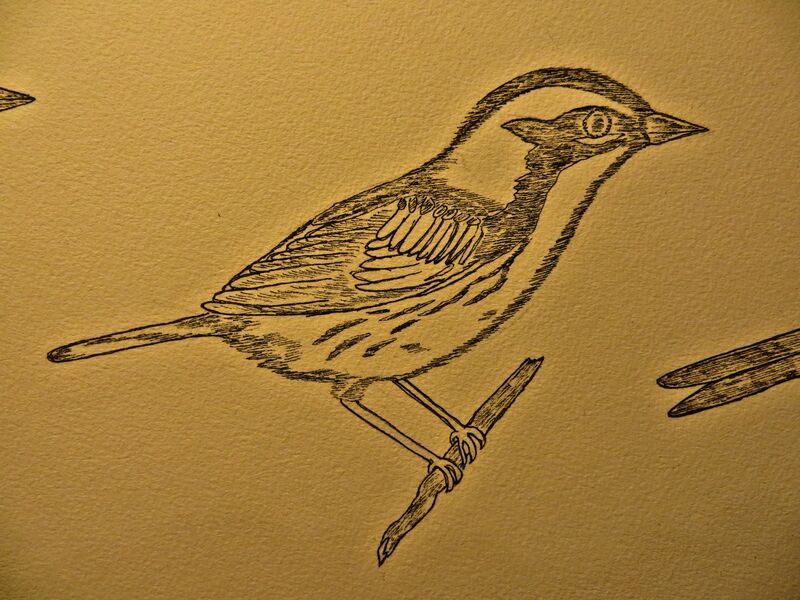 A warbler plate awaiting color. This collection of six: Hooded, Blackburnian, Yellow, Kirtland’s, Red-faced, and Magnolia. From their names to their colors they are like poems with wings. I started another flying Red-shoulder hawk. This one is flying directly over the viewer. I spent a lot of time going through two books by Brian K. Wheeler & William S. Clark. When I wasn’t hawk watching via bicycle along the railroad tracks. I’ve been trying to develop an illustrating style that better demonstrates texture and coloring. There are many intricate series of patterns in the feathers. Trying to replicate that is difficult. Oh it makes me wild, With twenty-eight years upon my head to have you call me child. My favorite bike rides were had either with great friends or wildlife. The best ones had both. I interacted with every bush and every shrub, every turkey vulture on high, every hawk riding the thermals. Whether the run was clean or not never mattered as much as the wildlife and the experience on the trail. close as fifteen feet. It looked at us with the greatest eyes a wildcat could have. or laying awake and hearing the whippoorwill call in the dead of night. The image of any hawk in flight inspires visions of adventure in my mind. I chose the Red-Shoulder hawk for this drawing because I see them frequently here in California’s central coast. 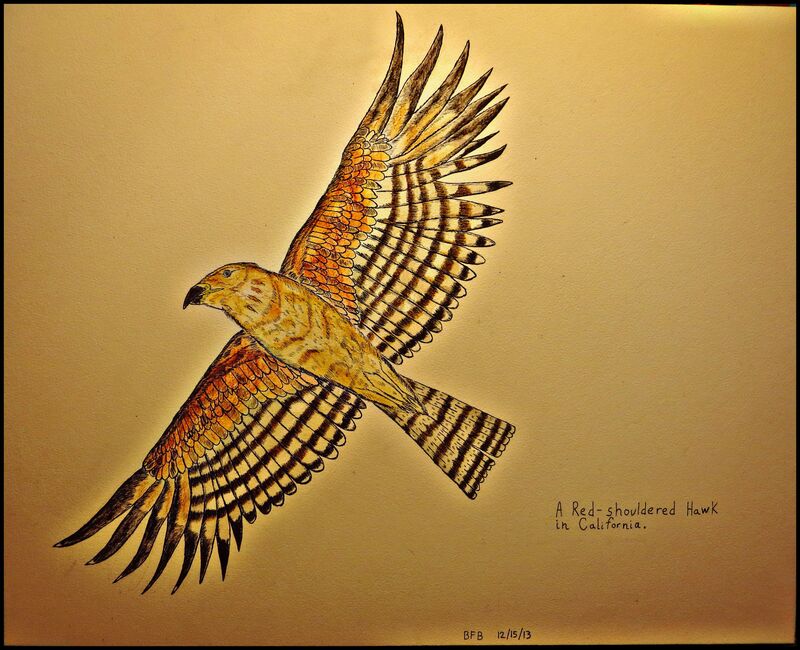 When I started this drawing of a Red-Shoulder hawk in flight I wanted to capture the adventures as they unfold in my mind time and time again. 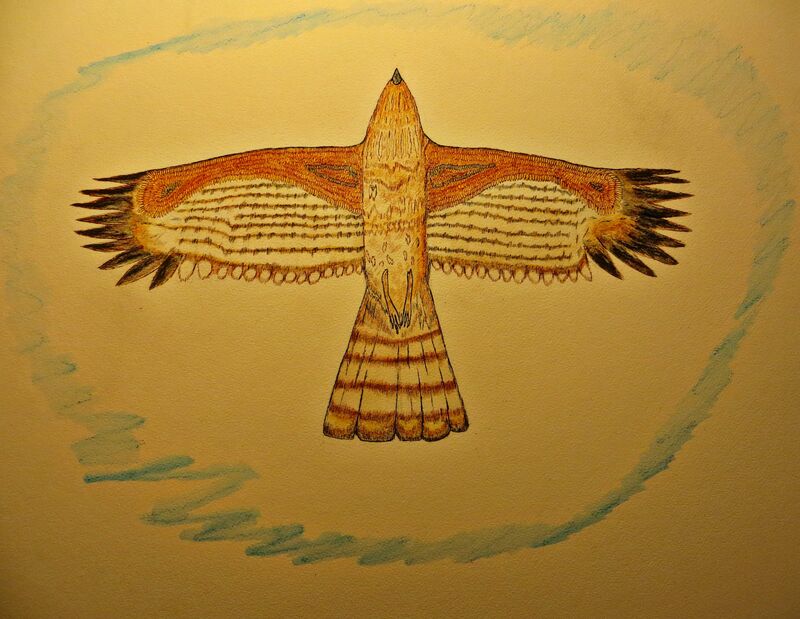 This was my first attempt at drawing a hawk in flight. I spent around 20 hours on it over the last two weeks. Time well spent in my mind. If what I tell myself is true, that times flies on the wings of my perched birds, then I should probably send them flying. Mantis in the tall grass. I was working in a prairie restoration project one day in the summer. 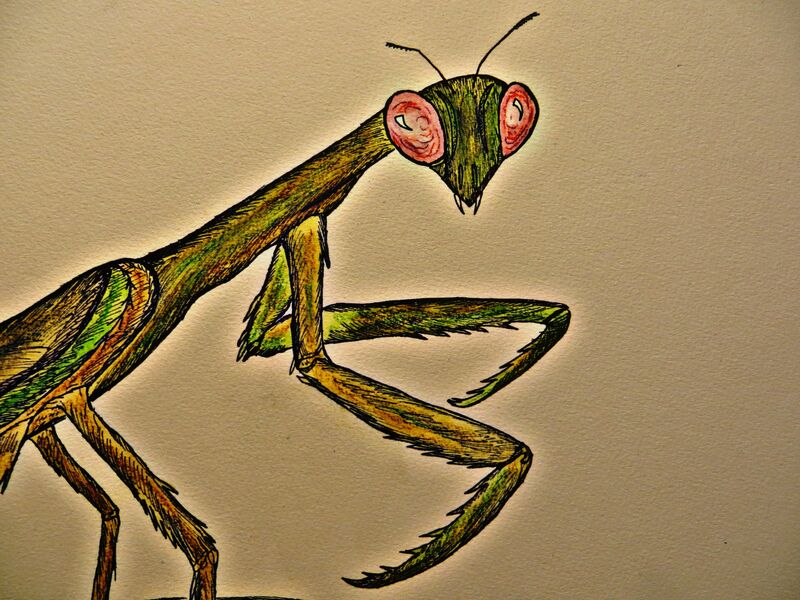 06 or 05, it was a typical humid July day and I don’t remember what seed I was after that day but in a stand of teasel I found a large (4″-6″) Praying Mantis. It looked at me with giant reddish eyes. Then before I had a chance to think it jumped at me and flew on wing inches over the top of my head. I fell over backwards startled and landed in a thistle patch. But I got a good look at her first and years later made this drawing. Nobody told me those things can fly. They can. Here’s a few species I have “finished” for my book project. 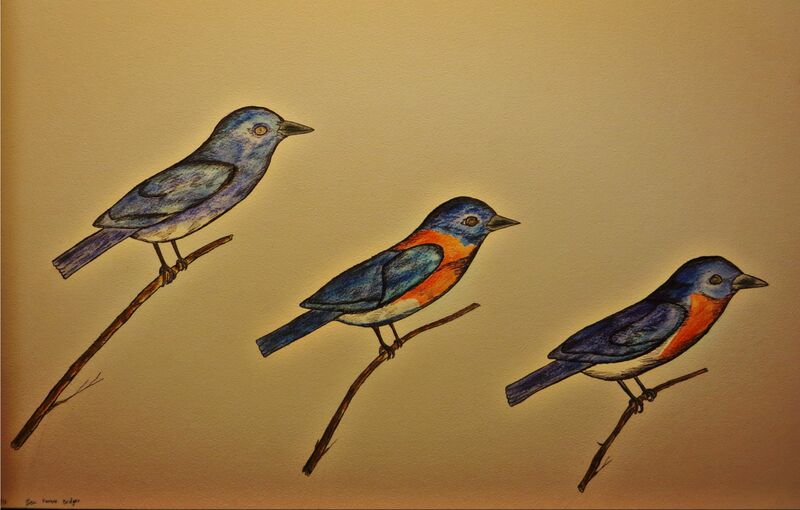 The three common bluebirds of north America, Eastern, Western, and Mountain. 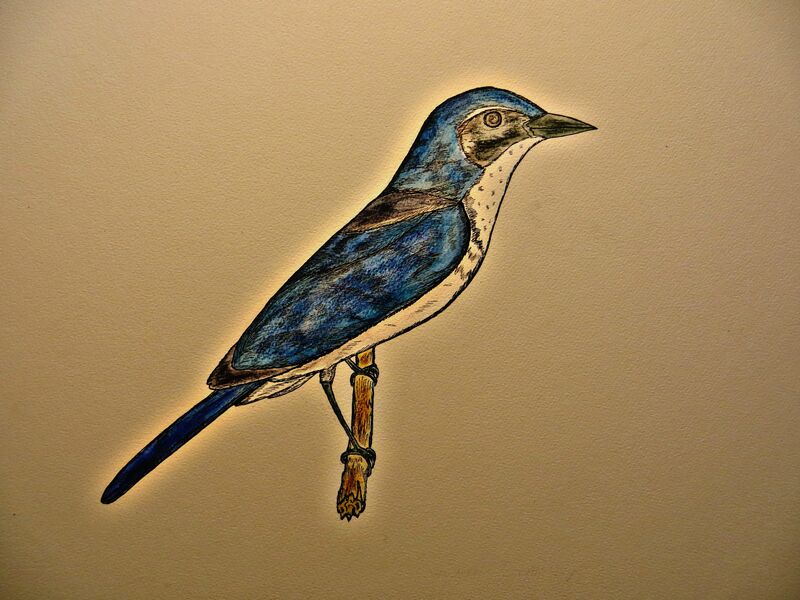 A Western Scrub-Jay. one of my favorites for their blue color and large personalities, They’re sure to let you know when they’re around. And two Warblers, A Cerulean Warbler and Yellow-Throated Warbler. All in pen and watercolor. A “throwback” from last December. A crow finds its nest has hatched a city. The crow has a sort of Audubon “wired” pose. 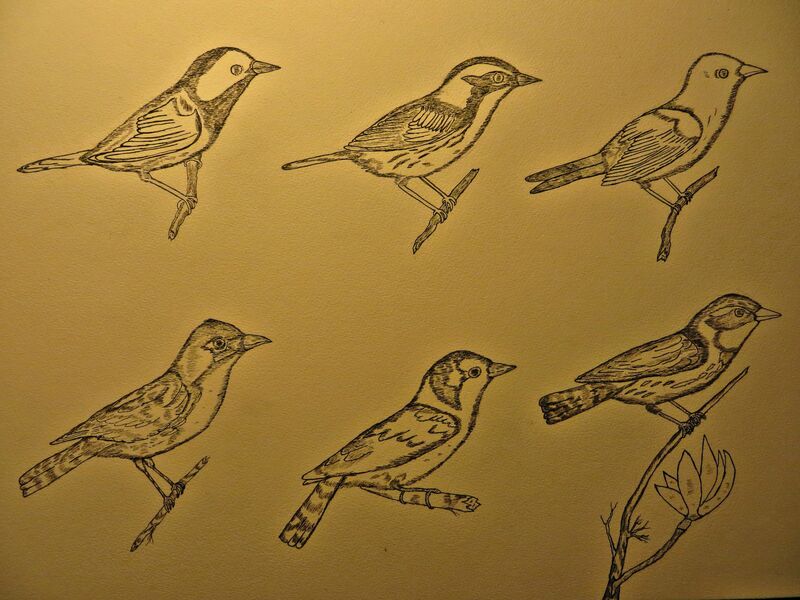 As much as I enjoy working towards a “scientifically accurate” bird drawing. I find that its a lot of fun to just mess around and make a skyline where one isn’t. 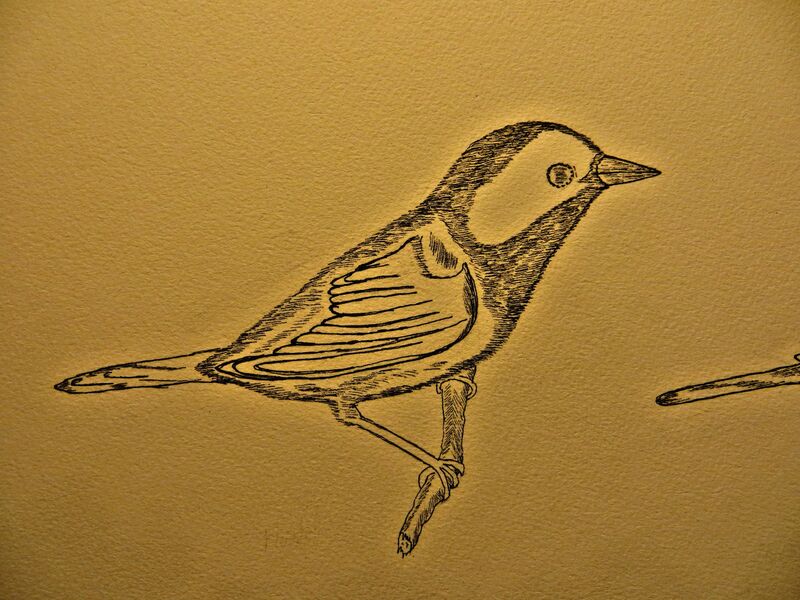 Life is too short to be taken seriously, bird drawings included. My two hollow birds of prey. I had a dream once with an Owl that turned into splinters. I think that’s the inspiration here. Pen and watercolor pencil. I haven’t seen the neighborhood Barn owls in a while, but I did take a drawing of one to my friend’s bike shop where I suspect the owls live near. 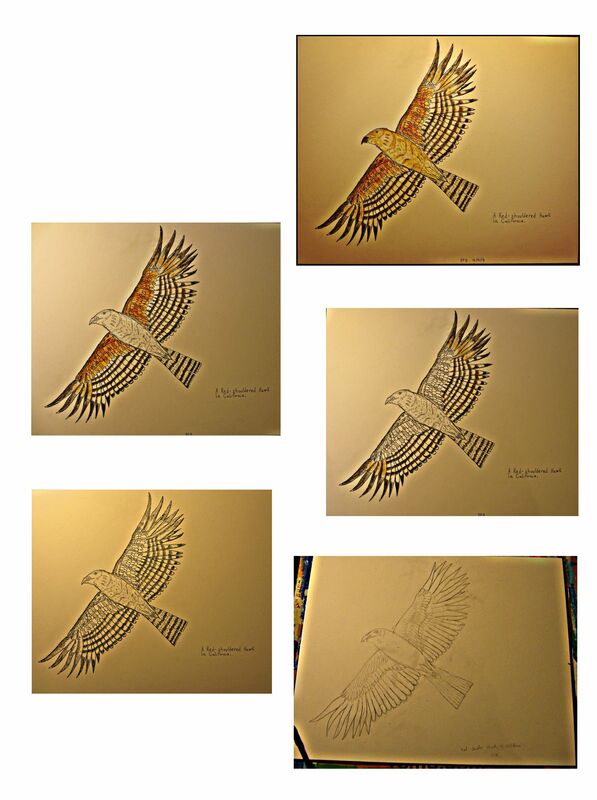 Here’s a run through from the two weeks I spent on this Golden Eagle. From pencil to watercolor and pen final. From where I’m sitting I can hear a barn owl screeching outside my window. Now there’s a language I’d love to learn. I can also see a sliver of the moon through a palm tree. It’s Night time in California. My father and his father. They both connected with the natural world the way many connect with a church. They showed me a lot of the natural world around the Midwest and Southern United States. 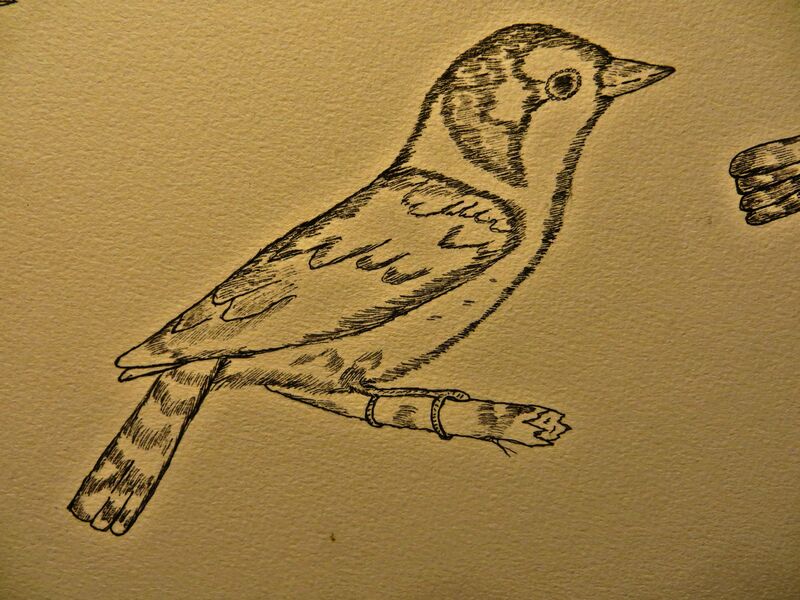 My Uncle Gary, for showing me how to catch birds in my mind and bring them to the page. My sister, my original partner in crime, who has continuously egged me on to go further and be the best I can. My mother, who taught me to share my findings with those around me and spread as much good as I can in my life. My friends. They’re everywhere. All around the greater Chicago-land area and all over Illinois. All across the Midwest, the East coast and west into rocky mountain Colorado. The good folk in California, the boys (and girl) at the bike shop I work at in the Central coast. Those crazy kids up in Portland Or. My family and friends can be found on every page I will ever fill with ink, color, or lead – that’s the only way I could have left my Midwest home to live in California. However, that doesn’t mean books aren’t important to me. Aside from the writings of Harrison, Brautigan, and Hemingway, here are some very influential books that have fueled my art and my heart. If you are interested in learning about the many birds of North America check these out. Stan Tekiela. Adventure Publications, 2011. Donald and Lillian Stokes. Little, Brown and Company, 2004. Brian K. Wheeler and William S. Clark. Princeton University Press, 1995. David Allen Sibley. Alfred A. Knopf Incorporated, 2000. Brian K. Wheeler and William S. Clark. Princeton University Press, 2013. Chandler S. Robbins, Bertel Bruun, Herbert S. Zim, Ph.D., and Arthur Singer. Golden Press, New York, 1966. Jerry Liguori. Princeton University Press, 2005. William S. Clark and Brian K. Wheeler. Houghton Mifflin, 2001. Allan D. Cruickshank. Washington Square Press, 1953. Herbert S. Zim, Ph.D. Western Publishing Company, 1949. Edwin Way Teale. Viking Press, 1964.